Today, I’m going into the past to pay tribute to a woman who gave us many reasons to smile (and to honor a friend who continues to nurture Erma’s humor and heart). 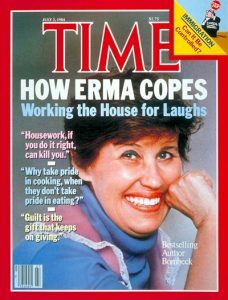 Erma was a household name back in the 70’s, 80’s and 90’s. 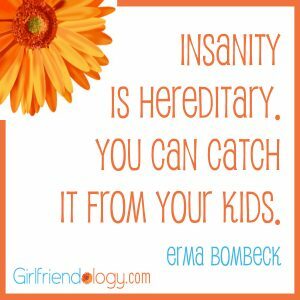 If you needed a pick me up, Erma’s irreverent words gave you a good laugh. Besides that, though, she was a hero for women and human rights and served on the Presidential Advisory Committee for Women. In these times of so much conflict and so many distractions, humor lifts our spirits. Erma, along with the throngs of current humorists, certainly have plenty of material. It makes me wonder how she would have spun her words to combat the craziness of this world. Take a peek into her legacy. If you didn’t know of her, let me know your thoughts? She continues to be a role model by reminding me that laughter is the best medicine, when life serves you lemons. Bombeck also had a very serious side too. She was a vocal advocate for the Equal Rights Amendment for women and served on the President’s National Advisory Committee for Women in the late 1970s. In the 1980s, Bombeck tackled a very difficult subject; childhood cancer, with her book I Want to Grow Hair, I Want to Grow Up, I Want to Go to Boise (1989). She visited a camp for children with cancer and spent a lot of time with families with children fighting cancer as part of writing the book. Like her other work, it found the humor in a challenging situation while making some poignant observations. 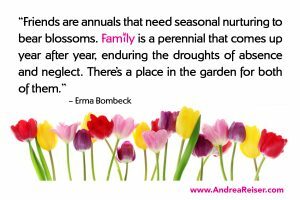 In 1978 Bombeck was involved in the Presidential Advisory Committee for Women, particularly for the final implementation of the Equal Rights Amendment, with the ERA America organization’s support. Bombeck was strongly criticized for this by conservative figures, and some U.S. stores reacted by removing her books. In 1972 the Equal Rights Amendment was proposed by the United States Congress to the states. Congress specified a seven-year period for ratification. Under Article V of the United States Constitution, ratification by at least three-fourths of the states is necessary, but at the end of the seven-year period, only 35 states had ratified, or three less than the required three-fourths. Of the 35 states that ratified proposed amendment, 5 of them rescinded their ratifications prior to the expiration of the deadline. Bombeck expressed dismay over this development.. I simply want to mention I’m beginner to blogging and honestly savored you’re blog. Likely I’m planning to bookmark your blog . You absolutely come with fantastic writings. Bless you for sharing your webpage. I simply want to say I’m newbie to weblog and seriously enjoyed you’re web page. Almost certainly I’m planning to bookmark your blog post . You absolutely come with wonderful stories. Bless you for sharing your web page. I just want to mention I’m very new to weblog and certainly liked this web-site. Likely I’m going to bookmark your site . You certainly come with superb well written articles. Thanks a bunch for sharing with us your webpage.